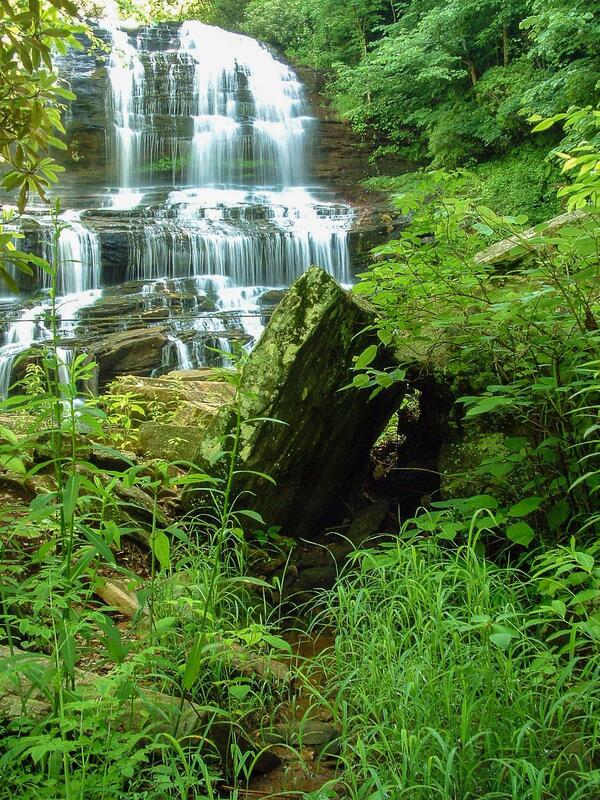 Pearsons Falls is a delicate, wide falls in a lush cove filled with wildflowers. It cascades over tons of tiny ledges with a couple of free-fall sections along the way, before scooting left near the bottom in a smaller cascade. It has one of the most photogenic forms of any falls in the area. Unfortunately, the creek can get a bit muddy at times. From Saluda, N.C., drive 3 miles East on US 176 and turn right on Pearson's Falls Road; or from Tryon, N.C., drive 4 miles West on US 176 and turn left. Follow Pearson's Falls Road for 2 miles to the gated entrance on the left. There is only one easy trail in the park and it leads 1/4 mile gently uphill along Colt Creek, through the lush glen, to the base of the falls. The trail has a few steps and picturesque small stone bridges along the way, and is well-maintained.